Cell division is the process cells go through to divide. There are several types of cell division, depending upon what type of organism is dividing. Organisms have evolved over time to have different and more complex forms of cell division. Most prokaryotes, or bacteria, use binary fission to divide the cell. Eukaryotes of all sizes use mitosis to divide. Sexually-reproducing eukaryotes use a special form of cell division called meiosis to reduce the genetic content in the cell. This is necessary in sexual reproduction because each parent must give only half of the required genetic material, otherwise the offspring would have too much DNA, which can be a problem. These different types of cell division are discussed below. Prokaryotes replicate through a type of cell division known as binary fission. Prokaryotes are simple organism, with only one membrane and no division internally. Thus, when a prokaryote divides, it simply replicates the DNA and splits in half. The process is a little more complicated than this, as DNA must first be unwound by special proteins. Although the DNA in prokaryotes usually exists in a ring, it can get quite tangled when it is being used by the cell. To copy the DNA efficiently, it must be stretched out. This also allows the two new rings of DNA created to be separated after they are produced. The two strands of DNA separate into two different sides of the prokaryote cell. The cell then gets longer, and divides in the middle. The process can be seen in the image below. The DNA is the tangled line. The other components are labeled. Plasmids are small rings of DNA that also get copied during binary fission and can be picked up in the environment, from dead cells that break apart. These plasmids can then be further replicated. If a plasmid is beneficial, it will increase in a population. This is in part how antibiotic resistance in bacteria happens. The ribosomes are small protein structures that help produce proteins. They are also replicated so each cell can have enough to function. Eukaryotic organisms have membrane bound organelles and DNA that exists on chromosomes, which makes cell division harder. Eukaryotes must replicate their DNA, organelles, and cell mechanisms before dividing. Many of the organelles divide using a process that is essentially binary fission, leading scientist to believe that eukaryotes were formed by prokaryotes living inside of other prokaryotes. After the DNA and organelles are replicated during interphase of the cell cycle, the eukaryote can begin the process of mitosis. The process begins during prophase, when the chromosomes condense. If mitosis proceeded without the chromosomes condensing, the DNA would become tangled and break. Eukaryotic DNA is associated with many proteins which can fold it into complex structures. As mitosis proceeds to metaphase the chromosomes are lined up in the middle of the cell. Each half of a chromosome, known as sister chromatids because they are replicated copies of each other, gets separated into each half of the cell as mitosis proceeds. At the end of mitosis, another process called cytokinesis divides the cell into two new daughter cells. All eukaryotic organisms use mitosis to divide their cells. However, only single-celled organisms use mitosis as a form of reproduction. Most multicellular organisms are sexually reproducing and combine their DNA with that of another organism to reproduce. In these cases, organisms need a different method of cell division. Mitosis yields identical cells, but meiosis produces cells with half the genetic information of a regular cell, allowing two cells from different organisms of the same species to combine. In sexually reproducing animals, it is usually necessary to reduce the genetic information before fertilization. Some plants can exist with too many copies of the genetic code, but in most organisms it is highly detrimental to have too many copies. Humans with even one extra copy of one chromosome can experience detrimental changes to their body. To counteract this, sexually reproducing organisms undergo a type of cell division known as meiosis. As before mitosis, the DNA and organelles are replicated. The process of meiosis contains two different cell divisions, which happen back-to-back. The first meiosis, meiosis I, separates homologous chromosomes. The homologous chromosomes present in a cell represent the two alleles of each gene an organism has. These alleles are recombined and separated, so the resulting daughter cells have only one allele for each gene, and no homologous pairs of chromosomes. The second division, meiosis II, separated the two copies of DNA, much like in mitosis. The end result of meiosis in one cell is 4 cells, each with only one copy of the genome, which is half the normal number. Organisms typically package these cells into gametes, which can travel into the environment to find other gametes. When two gametes of the right type meet, one will fertilize the other and produce a zygote. The zygote is a single cell that will undergo mitosis to produce the millions of cells necessary for a large organism. Thus, most eukaryotes use both mitosis and meiosis, but at different stages of their lifecycle. Depending upon which type of cell division an organism uses, the stages can be slightly different. Mitosis starts with prophase in which the chromosome is condensed. The cell proceeds to metaphase where the chromosomes are aligned on the metaphase plate. Then the chromosomes are separated in anaphase and the cell’s cytoplasm is pinched apart during telophase. Cytokinesis is the final process that breaks the cell membrane and divides the cell into two. 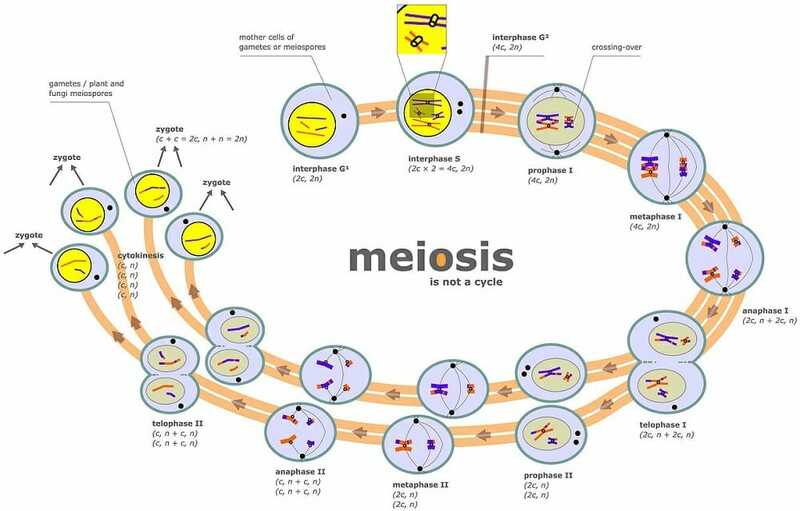 The stages of meiosis are similar to mitosis, but the chromosomes act differently. Meiosis has two phases, which include two separate cell divisions without the DNA replicating between them. Meiosis I and meiosis II have the same 4 stages as mitosis: prophase, metaphase, anaphase, and telophase. Cytokinesis concludes both rounds of meiosis. In prophase I, the chromosomes are condensed. In metaphase I, the chromosomes line up across from their homologous pairs. When they are separated in anaphase I and telophase I, there is only one form of each gene in each cell, known as a reduction division. Meiosis II proceeds in the same manner as mitosis, which sister chromatids dividing on the metaphase plate. By telophase II, there are 4 cells, each with half of the alleles as the parent cell and only a single copy of the genome. The cells can now become gametes and fuse together to create new organisms. Chromosome – Strands of DNA which carry genetic information, multiple of which are needed for most organisms. Mitosis – Cell division in eukaryotes. Meiosis – The cell division process that creates gametes. Binary Fission – The process of cell division in prokaryotes, which simply divides the cells contents. 1. Somatic cells are cells that fill the body, and must reproduce to repair damage. Gametic cells are cells that produce gametes. Which type of cell division do each type of cell undergo? B is correct. Somatic cells only ever undergo mitosis. They only reproduce when healing an injury or developing more tissue while an organism is growing. Gametic cells must do these basic tasks as well. Therefore, they undergo mitosis. They also can undergo meiosis to produce gametes. Organisms typically produce thousands to millions of gametes, requiring many gametic diploid cells to start. Once a cell becomes a haploid gamete, another diploid cell is needed to create more gametes. 2. Mitochondria are organelles in cells that create ATP, a molecule used for energy. Mitochondria must replicate inside the cell, separate from mitosis or meiosis, to regulate the amount of energy being delivered. In mitochondria, there is a ring of DNA that controls the mitochondrial metabolism. This mtDNA is replicated, the mitochondria elongates, and divides in half. What type of cell division is this? A is correct. Mitochondria must reproduce many times inside of a cell to provide it with enough energy. The simple form of division displayed is binary fission. No chromosomes are sorted, or reduced. The organelle is simply enlarged and split in half, with the DNA that controls it being duplicated as well. 3. Evolution depends on the successful replication of DNA. In fact, all DNA on Earth comes from only one or two original cells, and most organisms are related to each other. What is responsible for the different forms of life? C is correct. The majority of the variety on Earth is caused by both mutations and genetic recombination. Organisms that undergo meiosis can undergo events known as recombination in which parts of chromosomes are swapped. Even in asexual organisms, mutations and spontaneous recombination of DNA sometimes produce very successful organisms.